Strategy of Tension: West Creates Eugenics Nightmare in China - then Celebrates Activists Fighting It. April 28, 2012 - Anytime the Western media becomes ecstatic over the activities of a so-called "rights advocate," it is almost certain that they are either backed by convicted criminal, Wall Street speculator George Soros, or a recipient of US State Department-funded National Endowment for Democracy (NED) funds and support, or both. In the case of China's Chen Guangcheng, allegedly blind and having recently escaped from house arrest in a rural Chinese town, it didn't take long to trace his ties back to the US State Department's National Endowment for Democracy. 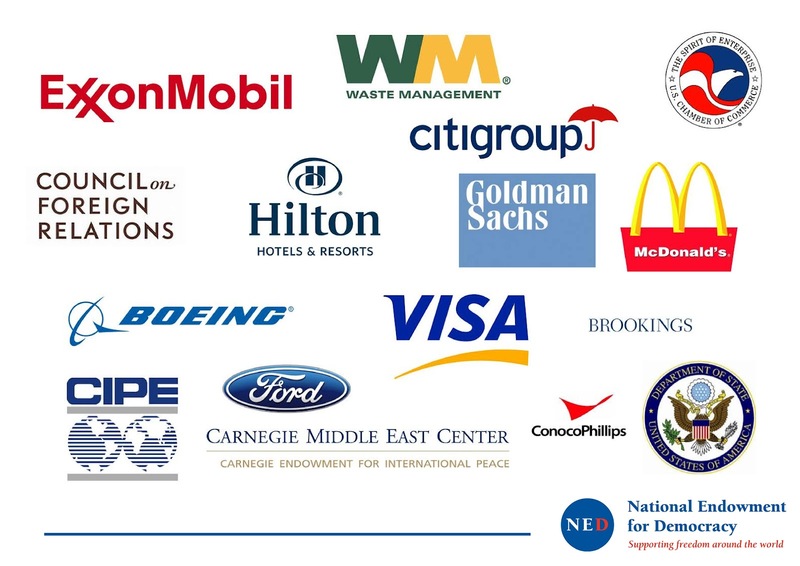 Image: A visual representation of the National Endowment for Democracy's corporate-financier ties found across their Board of Directors. Far from "human rights advocates," they are in fact amongst the most vicious warmongers and violators of such rights - simply leveraging such issues to disguise what is in reality corporate-financier hegemonic expansion. NED's "Democracy Digest" celebrated Guangcheng's "activism" and his use of "social media tools" in their 2011 article titled, "‘Extraordinary’ campaign for barefoot lawyer Chen Guangcheng." Democracy Digest reveals that fake-Christian charity front ChinaAid and propaganda outlet China Digital Times, who have been Gunagcheng's primary backers, are both NED grantees and that Guangcheng himself was the recipient of NED's 2008 "Democracy Award." This award has been more recently given to NED's proxies used during the US-engineered "Arab Spring." Images: Top - 2008's "Democracy Awards" presented to representatives of Chen Guangcheng. Bottom - In late 2011, Egyptian and Tunisian proxies receive their awards for helping the West topple sovereign governments and install client regimes - Tunisia in particular now sports a NED-funded "activist leader" as president. Also mentioned in Democracy Digest's article is the name of Council on Foreign Relations member Jerome Cohen as a "witness." 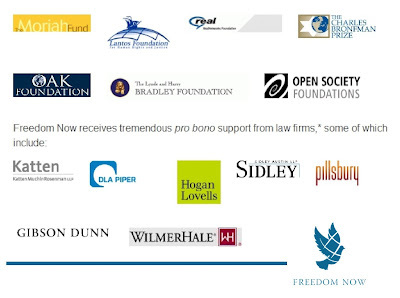 Cohen, of course, is providing "pro-bono" legal aid from the Council on Foreign Relations lined, Soros-funded "Freedom Now" organization for various dupes, stooges, and proxies of Wall Street and London. Readers may remember "Freedom Now" from their extensive involvement in supporting the Syrian opposition who triggered the current unrest now plaguing Syria, as well as being backers of Wall Street and London's proxy in Myanmar (Burma), Aung San Suu Kyi. Freedom Now is also currently backing a leading Bahraini activist, Abdulhadi al-Khawaja, who was regional coordinator of "Frontline Defenders," a Ford Foundation, Freedom House, American Jewish World Service, Soros Open Society Institute-funded "human rights" advocacy group. Al-Khawaja is now carrying out a "hunger strike" while in prison - part of a grander strategy to keep neighboring despotic regimes Saudi Arabia and Qatar loyal to the West's agenda. 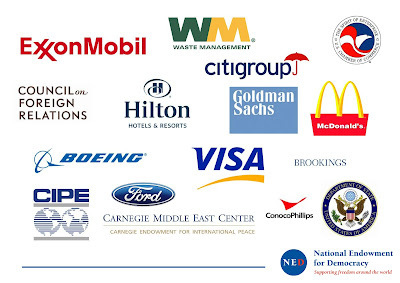 Image: Freedom Now's corporate and foundation sponsors revealing that it, like so many others, is yet another Fortune 500 front carrying out the agenda of the monied elite under the guise of "humanitarian concerns." 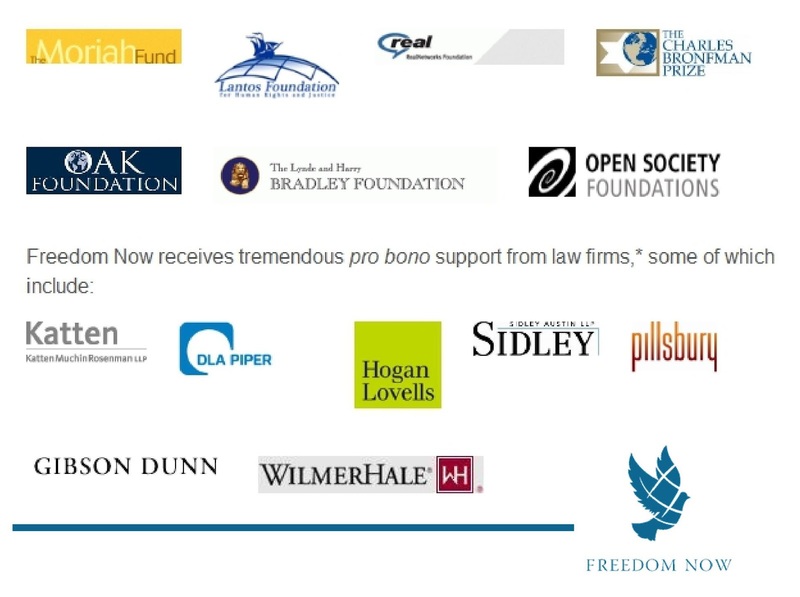 Freedom Now also backs a number of other Chinese proxies including Nobel Laureate and "human rights activist" Liu Xiaobo and Gao Zhisheng, both of whom are used to leverage the issues of human rights to undermine nationalist elements of China's government while asserting the primacy of "international law" and the West's "civil society" overlay across the vast East Asian nation-state. What makes the "blind activist" Chen Guangcheng different is that he has been allegedly fighting against China's abhorrent population control methods, including forced sterilizations and abortions to maintain China's draconian "one child policy." The catch of course is, the corporate-financier oligarchs backing Guangcheng's activism are also the architects of China's population control programs in the first place, supported, defended, and whitewashed fully by the United Nations (see also here, and here), and even gloried in excruciating detail in current White House science adviser John P. Holdren's 1,000+ page book, "Ecoscience." Indeed, the very practices carried out in China today were pioneered by Western corporate-funded foundations and government agencies like USAID's forced-sterilization program in Peru during the late 90's and the Carnegie Foundation and Rockefeller Foundation's work in founding the Nazi's eugenics cult, including the program Nazi war criminal Josef Mengele worked in before moving to the infamous Auschwitz death camp. China's brutal population control policies have been praised and lauded by people like Ted Turner who said during an interview with Diane Rehm (well worth listening to) that the Chinese "wisely instituted a one child policy" which he believes isn't "draconian." Worst of all, is the gushing admiration David Rockefeller himself has shown for Maoism and the genocidal "great leap forward" that killed at least 45 million in 4 years, and up to 80 million in all. Rockefeller noted in a New York Times article titled "From a China Traveler" in 1973 that “The social experiment in China under Chairman Mao’s leadership is one of the most important and successful in human history.” He considers the resulting policies "social innovations." 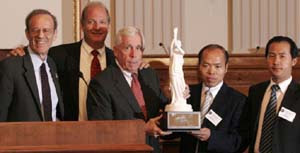 The fact that David Rockefeller founded and chairs the Council on Foreign Relations (CFR), a globalist forum of which nearly all of America's most influential politicians are members of and from which nearly all of America's policy originates from, constituting the collective interests of Wall Street and London's corporate-financier elite, are the very people now supporting Guangcheng's "activism" reveals astounding hypocrisy perhaps so gargantuan its full shape fails to come into focus for most. Indeed, the West's support for Guangcheng isn't because they believe the eugenics programs they have carefully constructed, meticulously propagated, and brutally claimed the lives of tens of millions with is now suddenly bad, but rather because Guangcheng represents a convenient point of leverage from which to undermine the Chinese government regarding an unpopular program the West itself has engineered. Feeding off of the warranted and legitimate backlash against China's population control programs may be the loose shingle the West can use to blow the rest of the roof off - where concerns over "democracy" and "civil society" have fallen flat. China's best response would be to withdraw from its obligations at the UN and replace its unpopular population control policies with technical education, research and development and other pragmatic industry and technologically-based, rather than policy-based solutions to deal with China's large population.